As if the media firestorm, illegal leaking, and judicial defiance was not enough to plague a President’s first 6 months in office, Never-Trump witches are attempting to curse Donald J. Trump “to fail utterly” in his capacity of President of the United States on June 21st. And this will be the sixth time. The so-called “binding of Donald Trump and all those who abet him,” first-appeared on Michael Hughes’s blog on February 20th, 2017. It encourages magical practitioners to petition “spirits of water, earth, air, and fire… [and] demons of the infernal realms” to bind both the President and all people who helped him become President (i.e., nearly half the nation that voted for him… and perhaps those who didn’t vote or voted third party). The ritual dates are midnight eastern standard time on February 24th, March 26th, April 24th, May 23rd, and so on for every waning crescent moon until the President resigns or is impeached. It is stated on the “Bind Trump” Facebook page that the June 21st ritual date is the most important because it coincides with the Summer Solstice. Aaiyyan Aaiyyanists shared a link to the group in order to invocate demons to bind Trump. 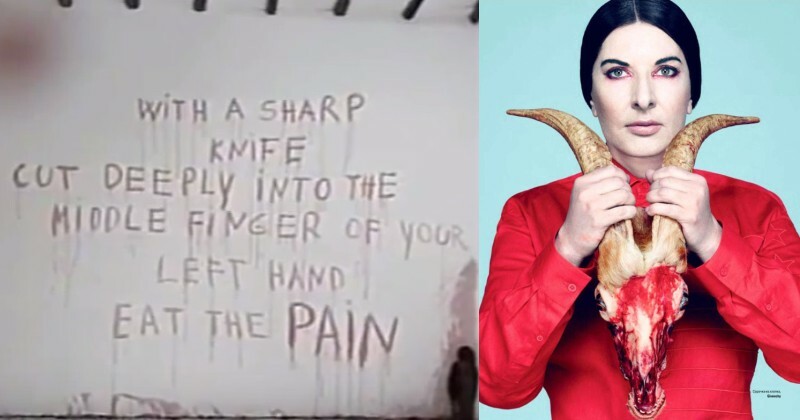 (Invocation means calling inside yourself, which is equivalent to demonic possession, according to Occultists). 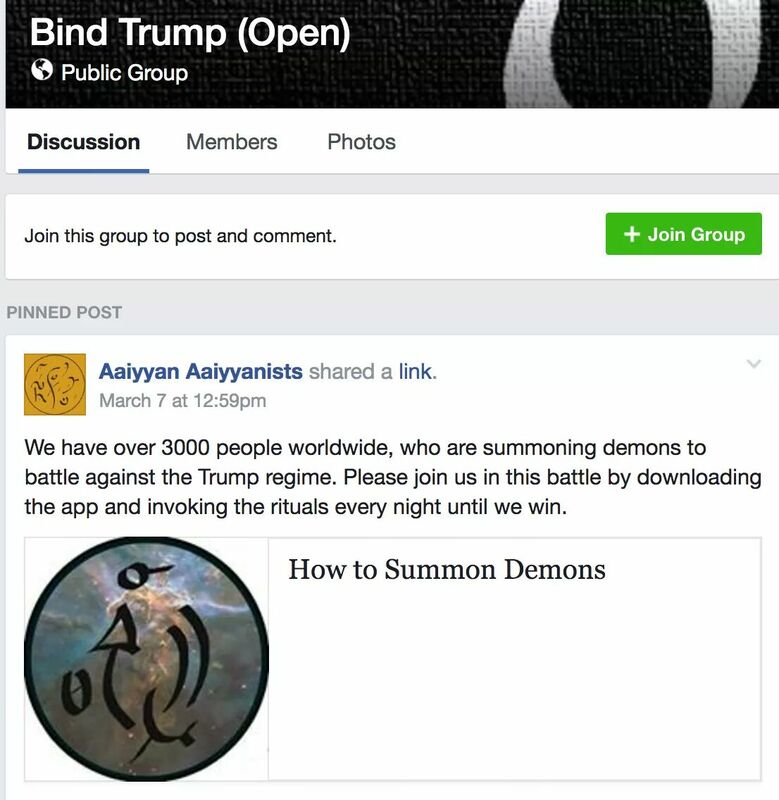 Aaiyyan Aaiyyanists shared a link to the Trump Binding group in order to call demons within. 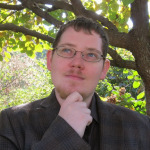 Mathew Gault, of The Medium, ran the bizarre story, advocating for its widespread execution. From there, ExtraNewsFeed, Elle, the Boston Globe, and many other outlets disseminated this treasonous call to mystical arms. Hughes provided an email address, bindtrump@gmail.com, for all media inquiries. Not all magicians agree that this is harmless flailing or righteous action from a disappointed segment of the electorate, however. David Griffin, Rosicrucian Imperator of the Hermetic Order of the Golden Dawn Alpha et Omega, has called the ritual both “black magick” and a “curse.” On his Hermetic Order of the Golden Dawn Blog, Griffin said, “As an American, I do not take kindly to a gang of Crypto-Nazi thugs pretending to be ‘progressive’ witches launching a magical war on the American people and the lawfully elected President of the republic.” The esoteric organization vows to counter-act the binding attempts. The Golden Dawn and allied magical organizations are not the only folks spiritually opposing this lunacy. On Twitter, Kevin Ambrose, of the Christian Nationalist Alliance, called on Christians to pray protection over our President during these rituals. The collective left’s meltdown over losing the 2016 election has manifested itself in some strange delusions: sexism, the Comey investigation, Russian hacking, and so on, never realizing that Trump won because Hillary Clinton was a broken candidate, known to be corrupt, and Donald Trump offered a viable vision of restoring the American Dream. And now, in an ultimate feat of insanity, the Left resorts to calling on demons and cursing Americans to get their way. It must have not dawned on these witches that, if Donald Trump resigns, is impeached, or is killed, then Pence would become the acting President. No, he lost the popular vote, and the only way Trump was elected was by electoral college. I think we’re all very well aware of that, and you needn’t add all the liberal spiels and claims to any of them having meltdowns. Spade is a spade, adding more hot air to it, isn’t going to change its shape. In this country, you win by electoral college. We should all know that by now. Since July we now have over 40,000 people summoning demons as part of the magic resistance (we have grown from 3,000 to 40,000 in the space of a few months). As well as several thousand Anarcho-Occultist and Anarcho-Satanist practitioners using this knowledge in many groups around the USA and the world. You can feel the exponential amount of resonant demonic energy saturating this realm and it will only grow stronger as time progress. You must join us Daniel!